With temperatures averaging 18°C and plenty of low cost flights taking off from the UK at the beginning of April, Crete is a perfect destination for a family holiday in Europe after a long, chilly winter. 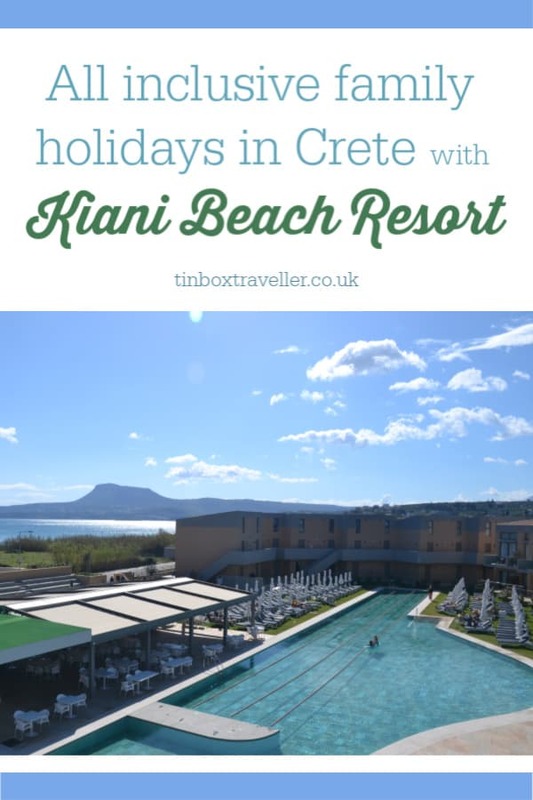 So, when an invite to review Kiani Beach Resort – an all inclusive family resort in Crete – dropped into my inbox, it didn’t take me long to book our plane tickets. Kiani Beach Resort is a 5 star, all inclusive resort and is located on a Blue Flag award-winning beach near the traditional Greek town of Kalyves. At the front of this luxury hotel complex you have panoramic views of the turquoise waters of Souda Bay across to the mountain terrain of Cape Drapanos. And at the back, you can see the incredible Lefka Ori mountain range, also known as the White Mountains. During our visit to Kiani Beach Resort the mountains were capped with snow. The contrast in landscapes was breathtaking. We arrived on the very first flight of the season from Bristol to Chania International Airport. 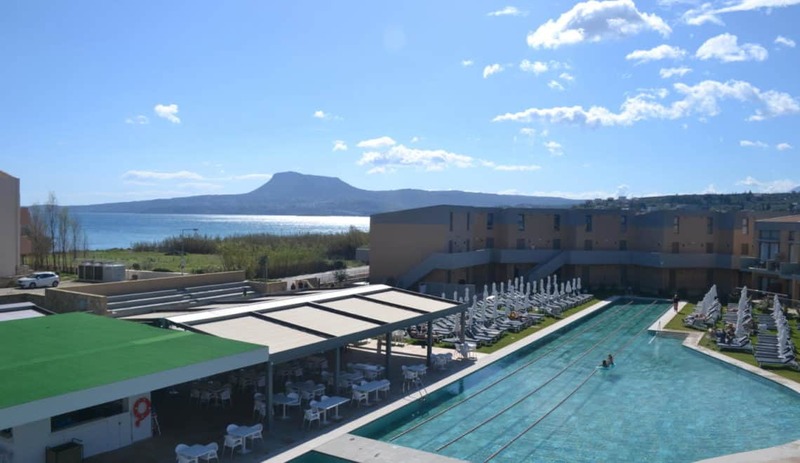 This Crete family resort had only been open for a few days so we were very excited to be among the first guests of 2019. Kiani Beach Resort first opened in 2007 and was extended with an additional complex of rooms, a restaurant, bar, spa and swimming pools in 2018. It now has accommodation and facilities for 750 guests. Our room was in the new part of the hotel but we also used the facilities in the original part of the complex throughout our seven night stay. Here is our Kiani Beach Resort review including everything you need to know about this family hotel in Crete and what we thought of the family rooms, dining, kids clubs, entertainment and the value of the all inclusive packages. How far is Kiani Beach Resort from the airport? There’s a range of family accommodation options at Kiani Beach Resort, including apartments that can sleep up to eight people. We saw lots of multi-generational family groups around the pool and in the restaurants, so it’s clearly a popular Crete hotel for large families and people holidaying with grandparents and friends. There are also interconnecting rooms to give even more flexibility for families. We checked into a Kiani Beach Resort Maisonette Loft which had a balcony and floor to ceiling windows overlooking the new complex’s main pool and bar. From the balcony we had glimpses of the sea and from the tall window in the girls’ room we had mountain views. The girls were very excited to have their own space on the mezzanine with twin beds and ensuite shower room. Mr Tin Box and I had our own king sized bed which, after a 3am start to catch our flight, I was incredibly happy to sink into for a siesta when we arrived. The room was decorated simply in whites and greys with modern furnishings and tiled floors. It felt stylish and calm. There was loads of hanging space in large wardrobes upstairs and downstairs, plus a couple of draws. Downstairs there was a larger bathroom with a shower and double sink. There was a range of hotel accessories like toothbrush, sewing kit and shower caps in a bowl next to the sink along with a body wash dispenser in the shower. Top tip: bring your own shampoo and conditioner as this isn’t provided in the room. Should we have needed warming up, there were two wall mounted heating units – one on each level – plus a ceiling fan to cool things down. We found that the loft space were the girls slept got a bit stuffy without this. An unexpected bonus of this room was a small kitchenette with coffee making machine, fridge, two hobs, a large sauce pan, plates, glasses, and cutlery. You can request cooking utensils from reception. As Kiani Beach Resort is an all inclusive family resort we didn’t use this but if we had tiny tots it would have been useful for storing and preparing baby food or snacks. On the long dressing table there was also a kettle, tea bags and coffee, and a hair dryer. You can call reception to request an iron and ironing board and for your room safe to be activated. Kiani Beach Resort is an all inclusive hotel in Crete with a couple of options for adding extra perks to your holiday package. As standard, all your meals, snacks and scoop ice cream for the kids are included plus local/non-branded alcoholic and non-alcoholic drinks. Beach towels, the kids club, evening entertainment, free wifi, free parking, gym access and exercise classes with the animation team are also free to all guests. So what benefits do you get from paying extra for the VIP all inclusive package? The difference in price between booking a room with an all inclusive package or VIP inclusive package was £8 per day when we stayed in April. That’s per room, not per person. If you think about the extra perks you get for that it’s a real bargain. You can get value from it just by having a bottle of wine with your main meal. Main meals are buffet style in both of Kiani Beach Resort’s restaurants. You can dine in either of them regardless of which side of the resort you are staying. Both have indoor and outdoor seating and the Pool View restaurant has clever glass walls that can be reorganised to allow for more or less alfresco dining depending on the weather. We found the flexible dining arrangements really convenient as we could pop into whichever restaurant we were closest to at meal times. We always had breakfast (served from 8am until 10am) in the Pool View restaurant as this was closest to our room. We had lunch (served from 1pm until 2.30pm) in the Sea View restaurant a few times because we just happened to be beside the beach, and dinner (served from 7pm to 9pm) was often back in the Pool View restaurant. If we had been at home the meal times might have felt a little late for our girls who usually have rumbling tummies at 7am, midday and 5pm sharp. However, the two hour time difference between Greece and the UK really worked in our favour. Plus there were sandwiches, wraps, salad, cake and pastries at the Pool and Beach Bars from 11am until midday and 4pm until 6pm to combat any hunger pangs. The food on offer in both restaurants was very similar. At breakfast there were cereals, cold meats and cheeses, bread, pancakes, cooked breakfast, fruit, pastries, tea, coffee and fresh orange juice. Lunch and dinner included a variety of salads, pasta and sauces, roasted meat, fish, vegetables and potatoes presented differently each day. The colourful collection of desserts included gateaux, slices of cake, ice cream, mousse and fruit. There was a children’s section where you could find standard kids’ fare like chicken nuggets, fish fingers, sausages, chips and vegetables each day. To be honest, I saw more adults diving into the chips than kids. Our girls loved filling up on pasta and tomato or Bolognese sauce with a side of tomatoes, sweetcorn and cucumber from the salad bar. The food was always hot, and the staff worked hard to make sure there was plenty on offer and that it was well presented. We always found a clean laid table, even at the busiest meal times. Something that’s worth doing if you have the VIP all inclusive package, and want to take advantage of your bottle of house wine with lunch or dinner, is to approach the person managing the wine as soon as you arrive. They don’t come to your table. There is a station in the centre of each restaurant where you can see the wine steward and request your bottle. Red, white and rose are available in 375ml bottles for individuals or 750ml for couples to share. You can also help yourself to local beer and wine from the self service pumps in both restaurants. I know not everyone is a fan of packing their children off to spend time with other people on a family holiday. But we value the time it gives us to relax doing things we individually enjoy. My girls, aged six and four, absolutely adored kids club at Kiani Beach Resort and appreciated the time to play and make new friends. For six days of the week there were kids club sessions for children aged four to eight-years-old in the morning from 10.30am until 12.30pm and then again from 3.30pm until 5.30pm. Younger children could also attend if their parents stayed with them. We used the afternoon session the most as it fitted in with spending time as a family and sightseeing in the morning, and allowing the girls to take part in fun activities with other children later on. Our girls loved the treasure hunts, arts and crafts, face painting and party games. When the weather isn’t too cold or too hot, the children go outside for activities on the beach and playground. In warmer weather they go to the pool, make sand castles on the beach, and can try fishing and snorkelling. The Kids Club meets in rooms on both sides of the hotel, one nearer the Sea View restaurant and the other beside the indoor pool and spa. The beachside club room is large with a long table for crafts, play houses, toys and a corner where toddlers can nap. On the other side of the hotel the club room is smaller, with a few tables, a play tent and toys. This room overlooks the indoor pool. At your first session you fill out a form with your details and any information that the staff might need about your child. Younger children can only leave the club alone if you say that’s OK.
A Teens Club also runs for nine to 14-year-olds twice a day for six days of the week. Their activities include sports, card games, quizzes, arts and crafts, and pool games. Kids are free to come and go during these activities. Kiani Beach Resort has a team responsible for entertaining guests throughout the day and evening. The Animation Team worked their socks off while delivering quizzes in multiple languages, playing chase with the kids, and running exercise classes, as well as the Kids Club. One of the daily highlights for the girls was the Kids Mini Disco which happened at both the Pool Bar and Beach Bar at 8.30pm. You could take your pick which one you went to and it would be followed by a show or live music which was advertised at the Animation Team’s office and hotel reception daily. The 8.30pm evening entertainment start time would usually be well past bed time for our girls. But the combination of the two hour time difference and a bit of quiet time in our room before dinner helped them push on through. The Animation Team, who the girls already knew from Kids Club, lead them in lots of party dances and made sure everyone was having fun before the main act of the evening started. Our favourite entertainment nights of the week were Greek dancing, belly dancing and a family magic show. The Animation Team brought out lots of little chairs so the children could sit at the front and get a good view of the tricks. At the other bar there was always a small music act on until about 10.30pm. Our room overlooked the Pool Bar so we were able to sit on our balcony and listen to music once the kids were asleep. We could hear the music in our room but it didn’t disturb the girls. Kiani Beach Resort has two outdoor swimming pools, two children’s pools/splash areas, and a heated indoor pool – all were very picturesque and great places to chill out. In April it was still a bit cold to use the outdoor pools but that didn’t stop the girls splashing around in the shallower kids pools while we took advantage of the plentiful sun loungers. The indoor pool is large and also has lots of loungers so you can relax beside the water if you don’t fancy a dip. Something that I noticed was how accessible the outdoor pools were. As well as steps, there were slopes and rails to help people get into the water. All around the hotel there were ramps and lifts too. 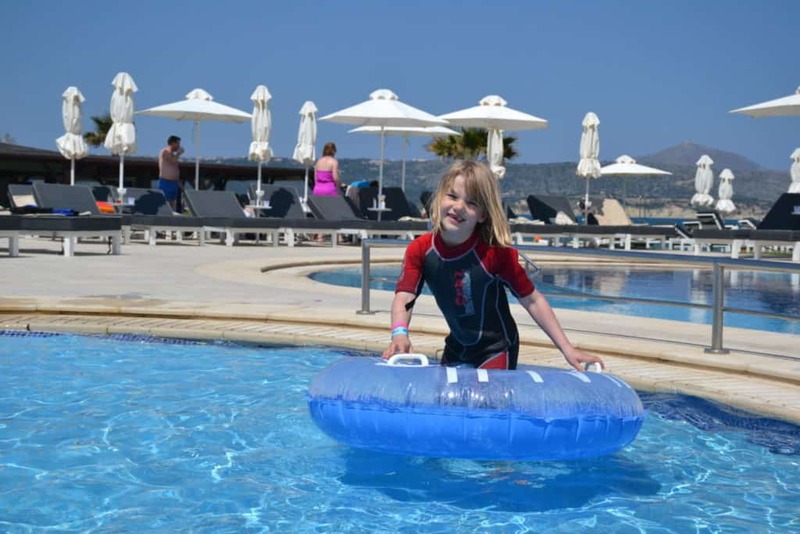 If you’re visiting Crete in the spring I can recommend bringing wet suits for using in the sea and outdoor pools, especially if you have water babies like us who can’t resist a swim or paddle. Free beach towels are available to pick up from the Pool and Beach Bars. The hotel is right on Kiani Beach which is a mix of sand and stones with beautiful views of Souda Bay. During our stay the water was quite choppy but as the season moves on this is where you can use the resort’s canoes and pedalos (free with the VIP all inclusive package) or pick up boat trips to hidden coves along the coast. Tot was content with jumping waves, throwing stones and recreating an ancient fort we’d seen on one of our days out. If you like to indulge yourself on holiday then Kiani Beach Resort has its own spa. All guests were being offered a free 15 minute treatment when we visited. We also had two free sessions in the spa’s Hamam jacuzzi, sauna and stream room as part of our VIP all inclusive package. It’s best to book your session in advance as there are limited spaces in the jacuzzi. Mr Tin Box and I had a steam and soak in relaxing surroundings one day while the girls were in Kids Club. I also booked in for a Cretan Massage which was a head to toe massage using the most delicious smelling oils with olive, orange and raki extracts. It began with a traditional Cretan welcome where my feet were sprayed with scented water and oil was massaged into my temple, behind my ears and on my throat. Seventy minutes later I floated off to find Mr Tin Box and the kids feeling thoroughly relaxed. Spa treatments range from 15 minute facials, exfoliations and body wraps costing from €30 to 50 minute couples massages costing €120. My Cretan Massage cost €90. Take a look at all the treatments available. On the beach front there is a large pirate ship play area, swings and play houses. This was one of our favourite places to hang out straight after Kids Club in the evenings, before getting ready for dinner. We could also pick up a drink and snack at the Beach Bar next door if the kids were peckish. Beside the Pool Bar there were another small play park, table tennis area and space for playing ball games. The hotel has it’s own mini market where you can buy essential toiletries, crisps and sweets, clothes, beach toys and souvenirs. Next to this there’s a games room with air hockey, a pool table and a few other games machines which you can pay to use. There are also go karts in a small amphitheatre beside the tennis courts. We had three days exploring the Chania region in north west Crete. Our excursions included a guided tour of Chania Old Town, a private tour of the ancient city of Aptera and Lake Kournas, and hiring a car from Kalives Travel to drive to the south coast of the island. All these excursions were booked through the Let’s Crete excursion office in Kiani Beach Resort’s main reception. I’ll be writing more about things to do in Chania and what we can recommend doing in Crete with kids another time. In the meantime check out my family holiday in Crete video below. You can also see more of what we got up to in the Instagram Story highlights from our Crete holiday. Kiani Beach Resort’s closest airport is Chania International Airport and the transfer to the resort takes 30 minutes. The drive takes you around the edge of the natural harbour of Souda so is a great introduction to the area. You can take a private taxi or book an airport transfer though the hotel. There are also a range of hire car companies at the airport. Kiani Brach Resort has a sister hotel, Kalyves Beach Hotel, which is a five minute drive away in the town of Kalyves. We visited for lunch on its opening day for the season. Kalyves Beach Hotel has room for up to 250 guests and has a more intimate feel than Kiani. You can book an all inclusive holiday. Or if you want to be a bit more independent and try out some of the local tavernas you can opt for bed and breakfast or half board. The VIP all inclusive package is also available here. Like Kiani, Kalyves Beach Hotel is located on a Blue Flag Beach. Running past it is a fresh water river where you can spot trout, ducks and terrapins. The girls had fun in the small sea front play park and on the sandy beach. Kalyves Beach Hotel doesn’t have a kids club but there is an animation team organising day time activities and a mini disco each night. There are also two small outdoor pools and a small indoor pool with sun loungers. There are family rooms with sofa beds for the kids and rooms that interconnect with the option of sea and/or mountain views. These were renovated in 2018 and more improvements are planned in the hotel’s public areas in the year ahead. 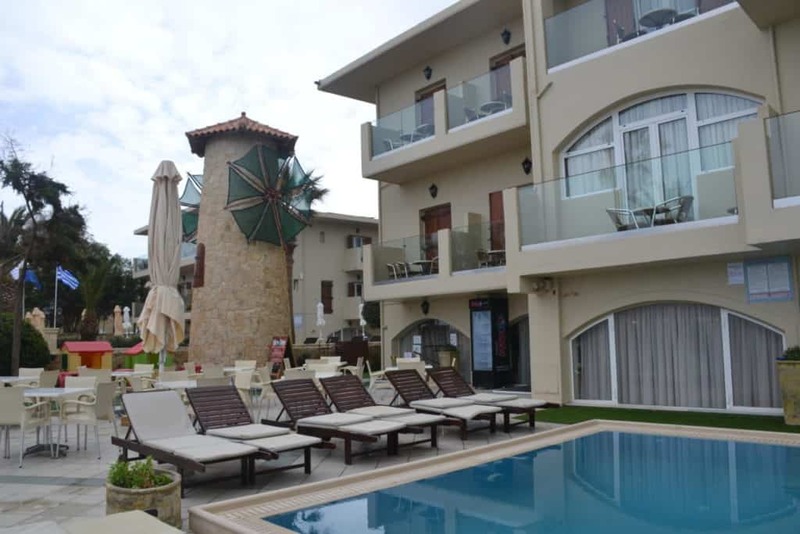 If you prefer a town location where you can walk to local tavernas and shops, and aren’t so worried about things like the kids club, larger pool complexes and spa then Kalyves Beach Resort is a great option for families too. Find out more about Kalyves Beach Hotel on the Seacrete Hotels website. If you are looking for an all inclusive family resort in Crete we can highly recommend Kiani Beach Resort for its family-friendly facilities, accommodation, entertainment, and hard working team. We had a great stay with just the right balance of activities and relaxation at the hotel. Exploring the region was made super easy with the onsite excursions office, taxis outside the hotel and a good local car hire company. We had wet days and sunny days during our Spring holiday in Crete, but still found plenty to do. Cooler days were perfect for exploring and warmer days were ideal for sitting beside the pool and playing on the beach, even if the water was still a bit icy. A seven night VIP all inclusive stay for two adults and two children in a Superior Maisonette Loft, like the one we stayed in, would have cost €1,443 at the beginning of April 2019. This includes a 20% discount which is available for all stays at Kiani Beach in April and May 2019. This cost does not include flights. Ours cost us £630 flying with Ryanair from Bristol to Chania International Airport at the beginning of April 2019. We had two hold bags and four carry ons in this price. Take a look at the Kiani Beach Resort website for the latest special offers. Disclosure: we were invited to stay at Kiani Beach Resort in exchange for coverage on my social media and blog. All opinions are my own and those of my family. We paid for our own flights to Crete and for some activities during our excursions. If you’re looking for an all inclusive family resort in Crete then why not pin my Kiani Beach Resort review for later. We just LOVE this hotel! We went there for two weeks last year with our to girls 4 and 6 years old. Now we are going back one week in may this year. The girls still sing and dance songs frim the minidisco, and can’t wait to be at the kids club with the fantastic animationteam. Best place E V E R! Ah, that’s so great! I’m really glad you enjoyed your stay. I’m sure you’ll love it in May too! Have fun!! What a fantastic comprehensive review – love getting all the details from someone who’s stayed and all the inside tips that you never normally know til you stay. The VIP package sounds a great deal.